While other manufacturers are touting new camera formats to increase market share, Tamron continues to improve performance on their lenses to offer cost effective alternatives. I had the opportunity to try out two introductions on the Photokina show floor. The first was an ultra wide angle 10-24mm f/3.5-4.5. Designed for APS-C sized image sensors the SP AF10-24mm Di II LD Aspherical (IF) lens has more acronyms than I can count but the performance shows. It is lightweight and fall off is reduced. The finish is different than the 11-18mm that it replaces. This is a great wide angle zoom to have in your bag. The second lens breaks new ground in wide range super zooms. The 28-200mm f/3.8-5.6 offers the highest zoom range that I have scene in a SLR lens. It was fun to try and guess when it would stop on either end of the zoom ranges. If you need all the acronyms — and who doesn’t — the lens is the AF28-200mm F/3.8-6.3 Di II VC. The VC stands for vibration compensation which you’ll need as this "walking around lens" will let you push the limits of handholding a long lens. The vibration compensation combined with its light weight gives you about 4 more stops before you grab the tripod. 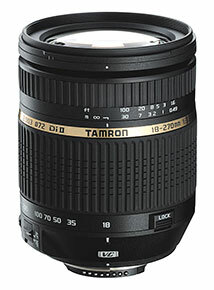 One "spec" that Tamron uses is that they call this lens a 15X lens. I wonder how that compact digital term for zoom power fits in within the digital SLR market. I only thought about this after I left the booth, having commiserated with them about the whole focal length conversion/cropping/magnification/field-of-view terminology among manufacturers.